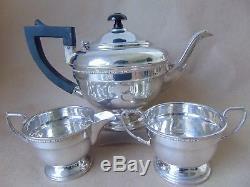 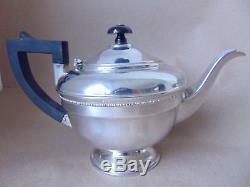 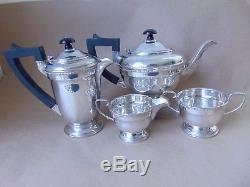 VERY GOOD QUALITY & BEAUTIFUL STERLING SILVER FOUR PIECE TEA SET SERVICE. 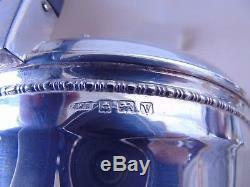 THEY ARE FULLY HALLMARKED FOR BIRMINGHAM 1945 (THE LION PASSANT FOR STERLING SILVER, ANCHOR FOR BIRMINGHAM AND DATE LETTER V FOR 1945) AND HALLMARKED ON THE LIDS. 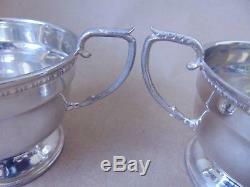 THE MAKER'S MARK ERNEST W HAYWOOD. 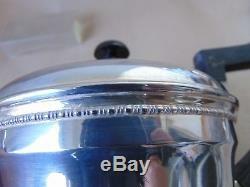 THE COFFEE/ HOT WATER POT IS 18CM HIGH X 10.4CM WIDE X 18.4CM LONG FROM THE HANDLE TO SPOUT AND 407 GRAMS. 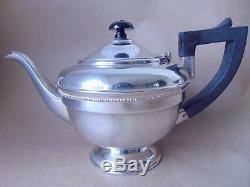 THE TEAPOT IS 16CM HIGH X 14.5CM WIDE X 25.8CM LONG FROM THE HANDLE TO SPOUT AND 423 GRAMS. 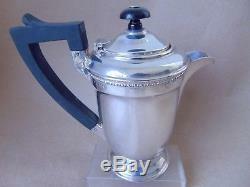 THE SUGAR BOWL IS 6.6CM HIGH TO THE RIM X 8.7CM WIDE X 13.5CM LONG LONG FROM THE HANDLE TO HANDLE AND 101 GRAMS. 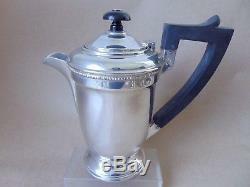 THE CREAM JUG IS 7.1CM HIGH TO THE SPOUT X 8.1CM WIDE X 13CM LONG FROM THE HANDLE TO SPOUT AND 89. 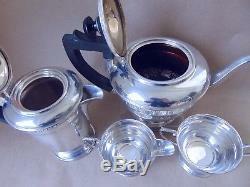 THEY HAVE A BEAUTIFUL DESIGN AND THEY ARE IN VERY GOOD CONDITION WITH NO ENGRAVING AND NO DING, LEAK OR REPAIR. 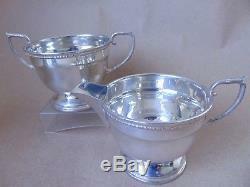 NICE ADDITION TO ANY COLLECTION, FOR USE OR FOR A BEAUTIFUL PRESENT. 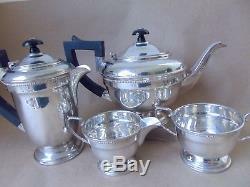 The item "BEAUTIFUL VINTAGE STERLING SILVER FOUR PIECE TEA SET SERVICE 1945" is in sale since Sunday, November 4, 2018.